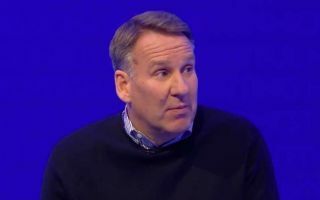 Arsenal legend Paul Merson has caused controversy with fans after revealing a one-sided Arsenal and Spurs combined XI, Merson included only two Arsenal stars in his team. The former Gunners man only selected Premier League top goalscorer Pierre-Emerick Aubameyang and playmaker Mesut Ozil as representatives of Arsenal in his combined XI. Merson revealed his combined XI on a Sky Sports show previewing the North London derby, which will take place on Sunday afternoon at 2.05pm. Thoughts on Paul Merson's North London Combined XI? Merson has often been found to be too critical of his former club in recent years but his latest antics have angered Arsenal fans and Merson has managed to become public enemy number one for Arsenal fans in his post-playing career as a pundit. Merson should be regarded as one of the key figures in Arsenal’s decorated history but the 5o-year-old has instead managed to make himself a player that Arsenal would rather forget in recent years. Why does Merston still have a job in football ??? It’s disgusting how them 2 clowns went on yesterday not giving Arsenal a chance your job as a pundit is to look at both sides not 1 but they did that I can’t believe Paul Merson who’s supposed to be on the side of Arsenal is agreeing with everything that Tim **** is saying ? Arsenal are currently sitting in 5th place in the league – 3 points off Spurs who are in 3rd place. If Unai Emery is serious about returning Arsenal to their former glory the Gunners will need to beat their rivals on Sunday afternoon.